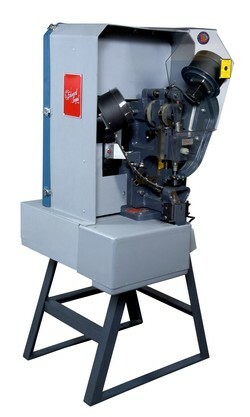 The Edward Segal Inc. Model 83GW is a fully automatic grommet machine that pierces a hole in the material and feeds and attaches both the grommet and washer, all in a single cycle. The result is a strong, durable quality settings with reduced operator fatigue, a safer operation and a fast return on investment. The 83GW is especially suited for lighter materials, including most vinyl and cloth, as it pierces a hole compared to punching a clean hole. With the pierce, the extra material folds back and provides a larger foundation to set the grommet and washer against.